You may recall that I posted here about my embarrassing and messy knitting area in my office. My goal was to have the blog holding me accountable for getting it cleaned up and organized. And it worked, I did it! In the past, I have categorized my stash by yarn weight but this time I chose to do it differently, sorting into a pile of my favorites (i.e. I love this yarn so much, I am so sorry I forgot you, I will use you soon), everyday “meh” yarn (i.e. I know you are great workhorse yarn and you will be used someday, promise), WIPS and yarns to donate to others (i.e. Why did I buy this? I need to stop accepting yarn just because it’s free, I can’t let it guilt me anymore). According to Ravelry, I had three WIPs on the go, with a few long term WIPs (UFOs) snoozing but I found a few that I had forgotten about! I discovered that I had nine WIPS in total, and have since cast on another two projects, so eleven. Is that too many?! No, right? Ok, maybe it’s time to work on getting these WIPs under control. I also may have a problem with collecting project bags. And larger knitting themed cotton bags. But, we’ll deal with that another time. My plan is to keep this area well organized long term, I hope I can keep it up! 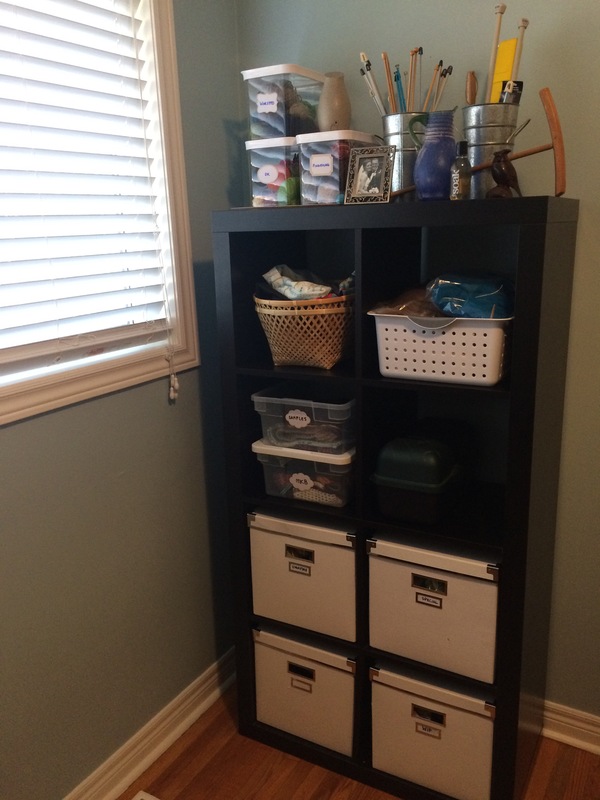 Do you know anyone who is struggling to get their knitting space organized? Share this blog post and maybe it will help them out!